Lives were changed at Winter Bible Seminar and Rhema Homecoming 2017. Those who came or watched online were encouraged, challenged, and comforted. Words of knowledge and words of wisdom were given to men and women in attendance. Those needing answers received them. The sick were healed and the oppressed set free! It was a glorious week. Here’s a sampling of what attendees heard. The “Connected” LEGO® theme built playful connections and a fun structure for learning! Kids were “Connected” through Salvation (adopted into God’s family); the Name of Jesus (power, rights, authority); Obedience (what it looks like, benefits); Prayer (talk to God anytime, anywhere, about anything, all the time); and Faith (trust God, He keeps promises). Kids used glow sticks on the last night—Connected to Be a Light—to visually see how the light of Christ spreads as we love others and let our lights shine. The power of God was strong during ministry time as kids addressed fear, healing, God’s love, and salvation. They were often on their knees in worship and prayer. Being connected to God is not just about us—it’s about helping others get connected too! Young people experienced God at the first event in the new Varsity Youth Building! The anointing of God fell as Denise Hagin Burns spoke on being a light and opened the altar for the youth to stop hiding their light and shine for God. Those dealing with depression were set free, and awesome times of praising God ensued. 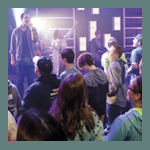 Throughout the week, students learned about being led by the Spirit, that we are spirits made in His image, and how to stay sensitive to the leading of the Holy Spirit by renewing the mind and living as a holy and pleasing sacrifice to God. What began as a dream 15 years ago became a reality, as Rhema Bible Church celebrated the grand opening of its new $2.5 million debt free, state-of-the-art Varsity Youth Building. Watch archived messages from Winter Bible Seminar at vimeo.com/rhema/channels. Just click on Winter Bible Seminar 2017.